In 2013 the PS4 beat out the Xbox One by more than a million units sold. Yesterday, Microsoft revealed that it had sold a whopping 3 million Xbox Ones in the space between the system's launch and 2014. That being the case, industry analysts have nonetheless pegged the PS4 as performing better and having an advantage over its competitor. It would seem those analysts were right. 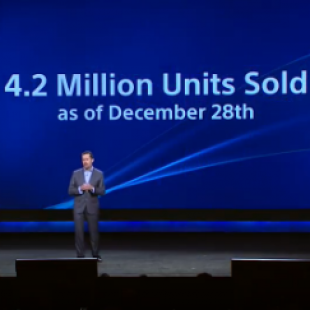 Speaking at Sony's CES 2014 conference today, Sony Computer Entertainment president Andrew House revealed that the company sold more than 4.2 million units between November 15th and December 28th. While this was somewhat less than House's own target of 5 million before the end of 2013, they're nonetheless impressive figures that the company hopes to expand on going forward. "The momentum of the PS4 system keeps getting stronger and we couldn't be more thrilled gamers worldwide are enjoying the incredibly immersive gaming experiences along with deep social capabilities and entertainment provided by our network," said House. "After a remarkable launch, we look forward to bringing even more exciting content and continuing to explore the power of the PS4 system by adding new features and services, including PlayStation Now, in 2014." PlayStation Now will be a new streaming gaming service previously discussed to be a potential method for PS4 owners to play older PlayStation titles on the backwards incompatible console. At CES, Sony confirmed that it will allow devices including game consoles, tablets, smartphones and televisions to use Now to stream PlayStation games from years past. While you could make a case for a multiplatform service like that not exactly being a system-selling feature for the PS4, we're getting the feeling that Sony isn't too worried about that given the console's current success.